Curly Hair Stylist Confessions: My Personal Curly Girl Journey. I had NO idea that I was a blessed with wavy hair, I just needed to learn how to nurture it. 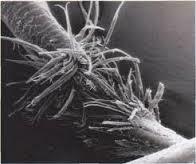 I had spent so much of my life with what I called frizzy hair, 80’s rockband hair,dried fried and petrified hair. I spent 34 years of my life struggling to find the perfect cut and style for my unmanagable hair. Never being truly happy beyond the one day it was cut and styled by the hairdresser. I had resigned myself to the flat iron and spending hours of my life as a slave to it. You might right now be thinking “You are a hair-designer, dont you EVEN know your own hair? '” Nope,I didn’t know, they do not teach you how to truly love and care for naturally curly hair in the beauty schools. They teach you to blowfry it and straighten it before you cut or color it(such terrible education). 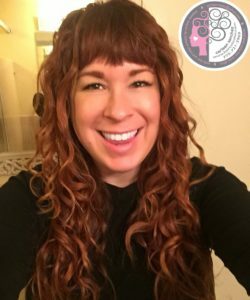 I had played around with “curly hair products and a diffuser” and always kinda liked what I saw but was usually put down by my family or loved ones who were used to the very fake, prim and proper, blowout with a curling iron finish. Now, I’ve put together a list of my favorite products. When the keratin treatments to straighten and smooth your hair came out, I was first in line, burning, breaking and frying my hair with over 400 degrees of heat pulled repeatedly and slowly down each precious strand of hair. No wonder I couldn’t grow it past my shoulders. it ALWAYS looked like it needed an inch or more cut off. 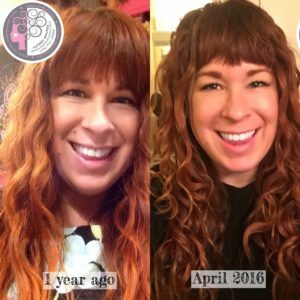 Two years ago I said enough is enough, I decided to learn the Curly Girl method and see what would happen. Day by Day and month by month my hair transformed. It went from barely a bend to juicy waves and curls. No need for curling irons or hours of my life wasted. I think having this curl suffocating past is crucial to why I can help other curly and Wavy people of the world learn unconditional love for themselves and their curls. I love my hair now in its natural and free wavy/curly state I no longer wish for straight hair. Now my hair styling life is easy and filled with great hair days and the super long mermaid hair I have always wanted. I celebrate my uniqueness and I cant stand the thought of another person walking around another day with negative thoughts about the gift of texture and wave and curl they have on their head. Now I am in the part of my journey where I literally feel like a Curl Missionary. Every curly or wavy or frizzy head of hair I see I want to reach out and love them, celebrate them, tell them they are special and that I want to help them. How I am trying to help the world love their curls. I can only physically serve 175 guests in my private, organic, Curly hair boutique salon in Reno, Nevada. So I have taken it upon myself to train and share my skills with the world thru: Mentoring carefully selected licensed passionate Cosmetologists thru my 800 hour paid mentorship program and teaching hairstylists at International education events to spread the Curl Love and Knowledge. I also post videos on my YouTube channel https://www.youtube.com/channel/UCQTLergFEgB3qmIzUkD2jag and this blog to help reach and educate curly people of the world. 5 tips for the Perfect Hair Consultation. 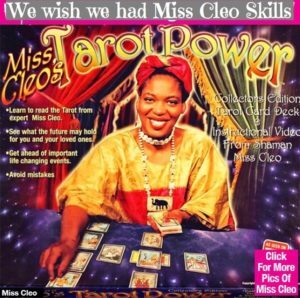 Although you may think all hairstylists have Miss Cleo Psychic skills, I can assure you most of us do not. My idea of copper and caramel are highly likely to be completely different than yours. My idea of a major change might be much more progressive than your idea. I do however want to make all of your hair fantasies come true. So lets get some ground rules set for a epic consultation and ultimately the best hair of your life. Do communicate with me by texting pictures of color and cuts you are lusting after. The sooner the better. If you see a picture of a beautiful color or cut you want to talk with me about on your next visit just text it to me right then. The photo will then be in our communication history and easy to pull up. I love photos sent a minimum of 24 hours in advance so I can think about you and do my homework before you even step foot in the salon. When I ask you if you have had your hair colored or any chemical treatments on it I really need the honest answer. I do not want your hair to break off or turn Blahorange. 100% chance that your hair will reveal its history and it can save you loads of frustration, money and damaged hair to be honest upfront. That color/relaxer/perm you did two years ago is still in your long mermaid hair unless it was cut off. Please come to your appointment with clean and detangled, dry hair in the best style you could do. I want to see what your skill level is in taking care of your hair so I can then formulate an education styling lesson to bridge the gap between what style you want and what you know now. I wont be there every morning to caress your beautiful locks into the style you crave, so I need to make sure I empower you and fill your brain and hands with the right styling knowledge and tools. These are some of my favorite Curly Girl approved products. Please turn off or silent your cell phone during our consultation in salon. I need your full attention and communication while we converse about your hair and your hair issues. The consultation is the most important time and the conversation should really be about you and your hair. Save the chit chat for later. Please do not bring children or extra people or pets (service animals welcome) to your appointment. The extra people/kids/pets are distracting to me, the hairstylist, and makes it hard to focus on you, the superstar. FUN, EDUCATION & 5 STAR SERVICE! I adore working with Wavy, Swavy, Corkscrew, Bottacheli, and all types of 2A, 2B, 2C, 3A, 3B, 3C curls. I love to color each special wave or coil to bring out the shine and dimension in order to keep my guests looking unique and beautiful. In fact I love your curls so much I’ve opened Reno’s first and only Curly Hair Artistry salon with focus exclusively on the needs of wavy, curly, swavy, Bottacheli and corkscrew curls. 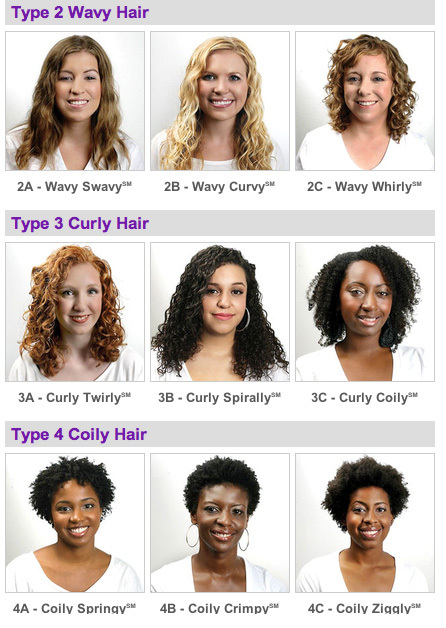 What Curl type does your hair most resemble? Accompanied by my three hydrate and style specialists, we attend to your Curls and help you on your curl journey. 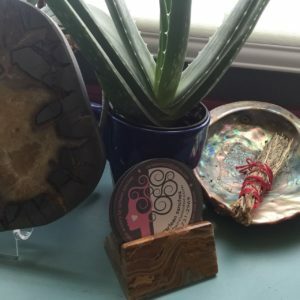 I work in a private salon environment with color lounge, complimentary snack bar, refreshments, disco balls, aromatherapy, plants, healing crystals and lots of extras with your ultimate comfort in mind. It starts with a consultation to really find out what color and haircut will make you feel and look amazing. Upon your visit, you will be offered a complimentary cocktail or refreshment. You’ll receive my signature custom haircut designed to bring out your best features, followed by the application of rich hydrating color that acts like a conditioner. Next, your visit to the shampoo lounge will send you on a wave of bliss, complete with a scalp and hand/arm massage, as well as an aroma therapy warm towel on top of the most advanced conditioner picked especially for your hair type. You will then embark on a HANDS ON styling lesson, which will provide you with a custom “curlscription” and a curly hair lesson targeted at your unique curls’ needs. I want you to be able to duplicate what we do so you can get salon results at home. 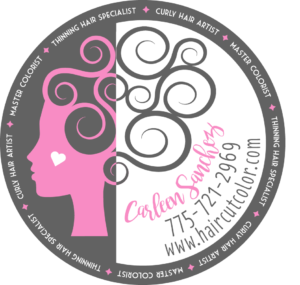 I will recommend products to solve your hair woes and gift you with a prize as well as topping your new color with complimentary hair sparkle extensions that really make the color POP! The hidden Dangers of coloring your hair at home. Professional Hair color in the hands of a skilled certified hair-colorist can actually improve the health of your hair. Home haircolor does the opposite. Home hair color is very aggressive and made with a one size fits all mentality, meaning that if your hair is thin or thick, curly or straight, colored or natural, the box of home haircolor has no idea. An emergency phone call to your hair salon is usually the end result of that box Home hair color adventure. A professional certified hair colorist will take into account your eye color, the porosity of your hair, the texture of your hair and your hair color dreams and aspirations. They will then formulate a CUSTOM shade that is usually a mixture of 3 or more shades that will improve the health of your hair. 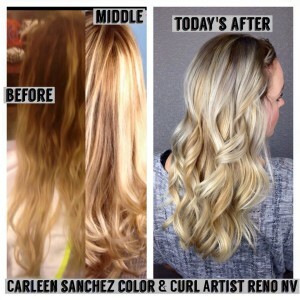 In my professional Carleen Sanchez Signature color bar experience I use hair color and olaplex that drastically improve the hair I am working with. Phyto-collagens- Botanically derived proteins restore hairs natural moisture balance and repair damage for maximum conditioning. Ceramide 2- A biomemetic lipid strengthens and protects the hairs cuticle. maintains hairs elasticity and shine while preventing fading and future washout. Quadramine Complex- Reconstructs hair structure for optimal health and condition. Restores soft, silky, manageable texture. Revives hairs luster and vibrancy. Renews hairs color with exceptional long lasting gray coverage. Olaplex-The ORIGINAL chemistry that multiplies bonds and cross-links broken bonds. This allows lightening services to be processed with minimal to no damage. 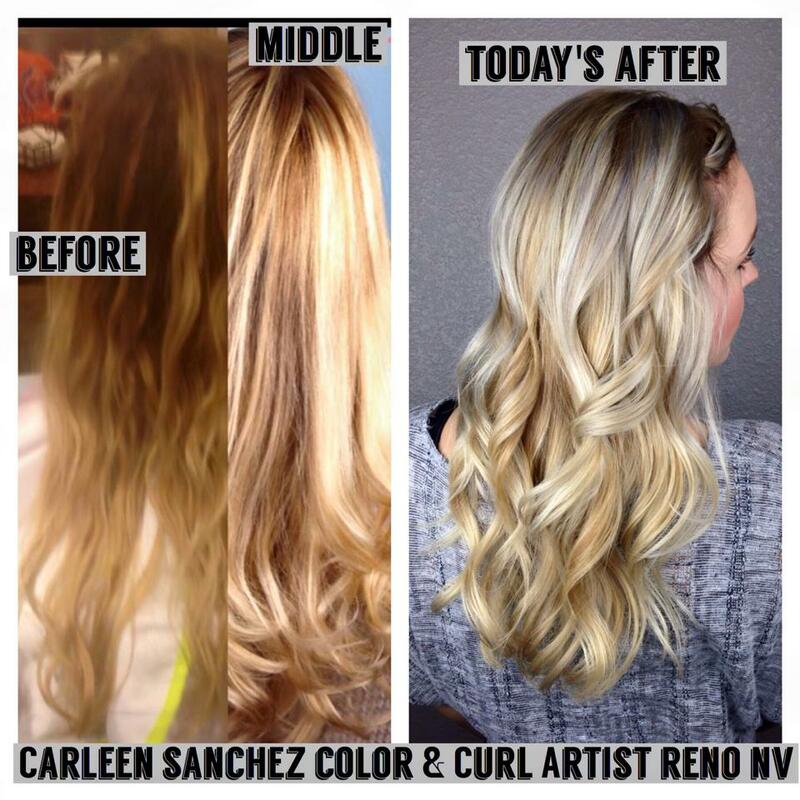 Blond Balayage Color Correction by Carleen Sanchez. Olaplex added to maintain health of hair during the lightening process. It can take multiple services to fix one home hair color job. Please seek out a certified hair colorist that wants to work with you to make your hair the best it can be. Reporter: When did you begin working in the hair industry? 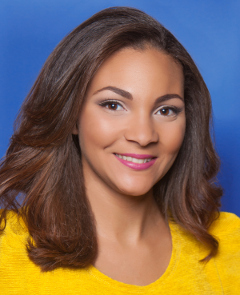 Carleen: In 2004, my uncle Steve Bebee was my mentor and the driving force in my success. 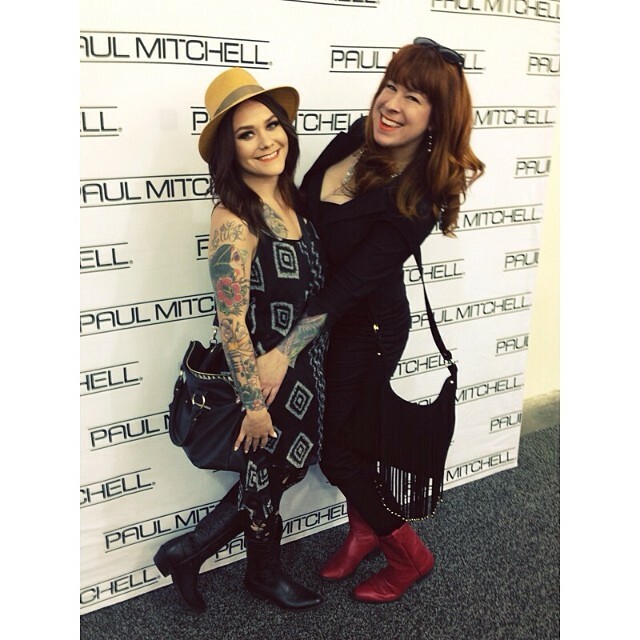 I worked many years as a salon consultant, educating and learning from local and celebrity hair designers. Reporter: How many years have you focused on curly hair cutting and styling? 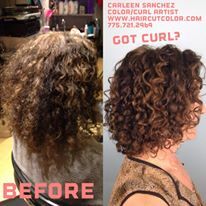 Carleen: I fell in love with curly hair after cutting and coloring Whitney Myers 6 years ago. I immediately started seeking out curl education, which is actually quite hard to come by. Most companies and hair designers want to comb, brush, and cut curly hair wet, which results in torn curls, uneven shelf like haircuts, or the dreaded triangle shape. I found wonderful guidance when I found and read the brilliant book “the curly girl handbook” by Lorraine Massey. 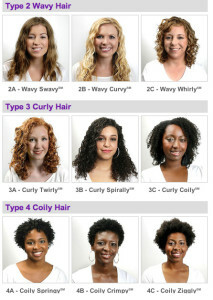 When I was asked to join Curly Hair Artistry International a whole new world of curl education opened up to me. I will be teaching some of my color and cutting and business practives at the Washington Dc Curly Hair Artistry Symposium in May 2015. Reporter: What do you love about your job? Carleen: The opportunity to be around wonderful people, doing what I love, all while making a living out of it. Reporter: Why open a salon solely for clients with curly hair? Carleen: Nevada needs people who want to care for and focus on the needs of 68% of its population. Reporter: What different types of training and education have you completed to prepare you to open this salon? 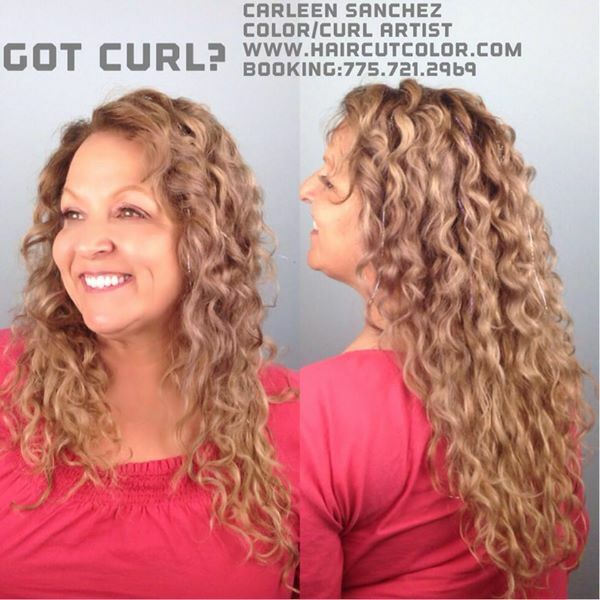 Carleen: Over $70,000 in advanced education and daily studying with the top Curly Hair artists across the world make me the hair artist I am today. 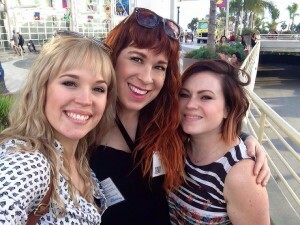 Curly Hair artistry training and camaraderie inspire me daily. One of Carleen’s celebrity guests. Lily was a Pro GLOW Wrestler (Gorgeous Ladies Of Wrestling). Reporter: When did you open this salon? Carleen: June 2014 I needed to create a Haven for color and curly guests to flock to. I wanted to share my little slice of heaven with them. Without the busy bustle of a large salon my guests can relax and enjoy some beauty time. Since I own the salon property I could do what I want with the interior design. Reporter: How far in advance do you book appointments? Carleen: After passing a pre-consultation conversation, new guests wait on a VIP list for when an established guest reschedules. Once they have made it in from the VIP list they can rebook future reservations. Reporter: Do you accept straight haired clients? 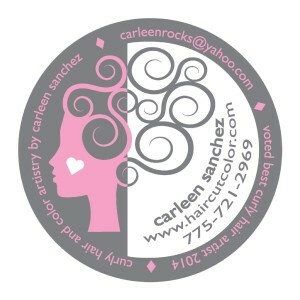 Carleen: I have established guests that love my hair color and dry cutting techniques. You’d be surprised at how many people think they have straight hair, when in fact it has a ton of natural wave and movement. Reporter: What do you get at this salon that is different from other salons in Reno? 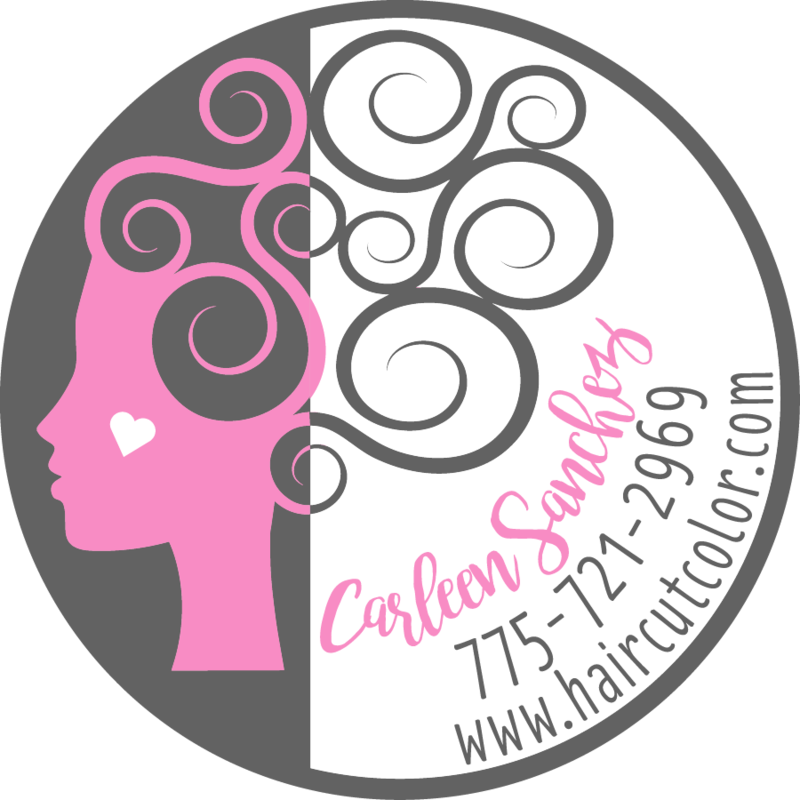 Carleen: No combs, brushes or products with silicone’s, sulfates or parabens will touch your curly or wavy hair. Special microfiber towels and t-shirts will be used to care for your fragile curls and waves. You will have a hands on lesson to learn how to style and do home care for your curls. My team and I focus on the needs of the heart of the guest as well as the specialized curl education for each guest. I also have a fully stocked Color-bar, Snack bar and delicious refreshments. Hot aromatherapy towel treatment and scalp, hand and arm massage on every guest. I also give gifts to my guests at every visit .I also have a high tech Deva 360 dryer and infrared color processing machine. Reporter: Explain some of the techniques you perform? Carleen: my Signature Carleen Sanchez Yoga cut, Balayage, multi-dimensional coloring techniques, frizz eradication, dry haircutting techniques, curl by curl custom coloring, curl by curl haircut, curl type discovery, guest education on care for and enhancement of their unique wave or curl. Reporter: How many people work in your salon? 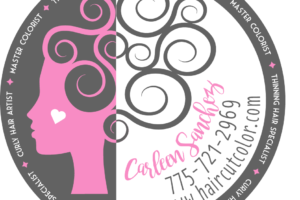 Carleen: I have three licensed stylists going thru my Residency Mentor-ship program who choose their hours and assist me with caring for my guests. Reporter: You have consulted many celebrity hair stylists and salons, now with your own salon, how are you giving people the opportunity to learn your techniques? Carleen: I mentor three fully licensed passionate and kind people to work, learn and earn with me. I teach my guests and assistants how I color, cut and care for wavy to curly hair. Teaching them how to instruct the guests and know the unique needs of each curl type is furthering our curl craft. Reporter: If someone wants to be mentored by you what can they do, are you always accepting students? Carleen: They can submit a resume and if they seem passionate about life and the craft, I will interview them. I only take on three rising stars each year, so I can really focus on their growth. Reporter: Why do you mentor? What about educating others makes you continue? Carleen: My greatest personal achievement is being able to inspire and lift others up on a day to day basis. Mentoring rising stars in this industry is an enjoyable way to give back to my community, and I enjoy the fresh eyes and ideas they bring into my life. Carleen with her most recent graduate of her mentorship program. I am the worlds happiest little curly hair and color artist. It is my mission to help the people of the world embrace their gift of curls. Oh my gosh! 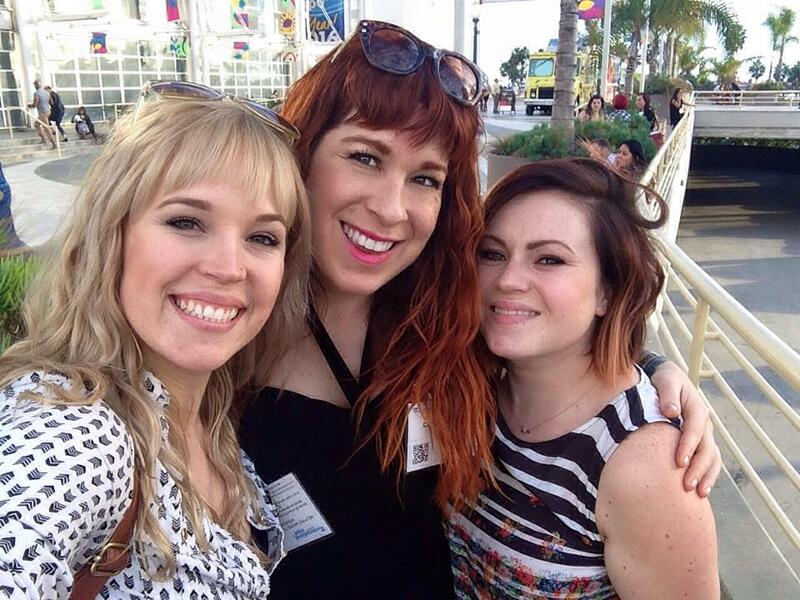 I had so much fun with Carleen and her two beautiful assistants today. I walked in looking like a fluffy-headed crazy cat lady, and walked out looking like a bohemian goddess. Carleen and her team make the experience fun, interactive, and educational. They show you how to care for and style your hair, and have you practice while you’re there so they can give you pointers on what you’re doing right/wrong. Not only do you get clearly written directions to take home so you can remember how to style your new beautiful curly hair, but you also get free little gifts, and a wonderful hand and scalp massage! Never have I ever had a hair salon experience like this one. I have already rebooked for color and I’m so excited for that! Your Curls are worth the wait! I am committed to helping people reclaim their self worth and embrace their natural curls and waves. Nothing inspires me more in my business than helping people to love their natural hair in every way. As a result of raising their happiness vibration they attract success in other areas of life, improving business, self love, relationships, wealth and lifestyle. I cant wait to celebrate you, your curls and your unique value and presence as a powerful human.